Objective To compare the performance of adults with multifocal intraocular lenses (MIOLs) in a realistic flight simulator with age-matched adults with monofocal intraocular lenses (IOLs). Methods and Analysis Twenty-five adults ≥60 years with either bilateral MIOL or bilateral IOL implantation were enrolled. Visual function tests included visual acuity and contrast sensitivity under photopic and mesopic conditions, defocus curves and low luminance contrast sensitivity tests in the presence and absence of glare (Mesotest II), as well as halo size measurement using an app-based halometer (Aston halometer). Flight simulator performance was assessed in a fixed-based flight simulator (PS4.5). Subjects completed three simulated landing runs in both daytime and night-time conditions in a randomised order, including a series of visual tasks critical for safety. Results Of the 25 age-matched enrolled subjects, 13 had bilateral MIOLs and 12 had bilateral IOLs. Photopic and mesopic visual acuity or contrast sensitivity were not significantly different between the groups. Larger halo areas were seen in the MIOL group and Mesotest values were significantly worse in the MIOL group, both with and without glare. The defocus curves showed better uncorrected visual acuity at intermediate and near distances for the MIOL group. There were no significant differences regarding performance of the vision-related flight simulator tasks between both groups. Conclusions The performance of visually related flight simulator tasks was not significantly impaired in older adults with MIOLs compared with age-matched adults with monofocal IOLs. These findings suggest that MIOLs do not impair visual performance in a flight simulator. The Australian Civil Aviation Safety Authority (CASA) suggests that multifocal contact lenses and multifocal intraocular lenses (MIOLs) ‘cause unacceptable impairment of vision’, withholding subjects with such lenses from holding a pilot’s license. This is the first study on flight simulator performance of individuals with MIOLs. Our findings suggest that the performance of vision-related flight simulator tasks was not significantly impaired in subjects with MIOLs relative to that of age-matched monofocal IOL subjects. Our study results could contribute to a revision of the CASA guidelines in that subjects with MIOLs become legally eligible to hold a pilot’s license. An area that has attracted particular interest in terms of the functional implications of MIOLs is the vision requirement for pilots. The Australian Civil Aviation Safety Authority (CASA) suggests that multifocal contact lenses and MIOLs ‘cause unacceptable impairment of vision’.6 This ruling has been widely upheld, but until now there is a lack of direct evidence to suggest that pilots with MIOLs will experience greater visual difficulties than age-matched subjects with monofocal IOLs, for whom there are no flight restrictions. The aim of this study was to compare the performance of MIOL subjects with age-matched IOL subjects in a realistic flight simulator. Twenty-five subjects, 60 years or older, were enrolled in the study after previous uncomplicated bilateral cataract surgery, with implantation of either monofocal (monoIOL group) or multifocal IOLs (MIOL group). Subjects were recruited from the patient database of the author (LL), an experienced cataract surgeon. The study adhered to the tenets of the Declaration of Helsinki and was approved by the Queensland University of Technology Human Research Ethics Committee. All subjects attended two testing sessions. Binocular distance visual acuity was tested using high-contrast ETDRS charts at 4 m under mesopic luminance (0.75 cd/m2) with dimmed room lighting (3 lux) and under photopic luminance (108 cd/m2) with high room lighting (440 lux). Visual acuity was scored in logMAR, using three different ETDRS charts. Binocular contrast sensitivity was measured binocularly at 3 m with the Pelli-Robson test under the same mesopic and photopic lighting conditions as for visual acuity. Contrast sensitivity was scored in log CS. Two different charts were used. Binocular distance defocus curves were measured using high-contrast ETDRS charts at 4 m. Defocus was sequenced from +1.50 to −5.00 dpt in 0.50 dpt steps over subjects’ habitual distance correction, and the letter charts alternated for each measurement. Binocular mesopic contrast sensitivity (without and with glare) was tested using the Mesotest II.7 The contrast of the target varied by 0.1 log units, corresponding to 95%, 80%, 63% and 50% of the contrast threshold and was conducted without (background luminance of 0.032 cd/m2) and with a glare source (0.35 lux at the pupil, located three degrees to the left of target; background luminance of 0.1 cd/m2). Five presentations were tested at each of the four contrast levels, without and with the glare source. The total number of errors was calculated. For halometry, the halo produced by glare from a bright white LED attached to the centre of an iPad screen (iPad4, www.apple.com) was determined as the position closest to the LED where two out of three presentations of a randomly presented high contrast 20/50 letter (0.4 logMAR) were correctly identified.8 A seen-to-not-seen approach was used with a 0.1-degree step size along eight meridians. The halo area (deg2) was determined by calculating the area of the halo surrounding the LED glare source. The NeurOptic pupillometer (model 79101; NeurOptics) was used to measure pupil size in both eyes under photopic and mesopic lighting conditions. The subjects also completed a validated questionnaire on their self-reported quality of vision (QoV).9 This included questions relating to the quality of their distance and reading vision, with glasses if they wore them, both during the day and at night. A series of questions asked about the frequency and severity of symptoms experienced during everyday activities in the past week, for example, glare, haloes, double vision and focusing difficulties.9 To reduce the possibility of inconsistent responses, this questionnaire includes QoV pictures to characterise the different visual symptoms. Finally, subjects reported whether they achieved spectacle freedom following their surgery, for distance, intermediate and near activities. All subjects also completed one session assessing their vision-related flight simulator performance at Aviation Australia, near Brisbane Airport. The fixed-based simulator (PS4.5) (https://brisbane.flightexperience.com.au/the-simulator/) is based on the Boeing 737-800. The simulator has received certification for pilot training from the Federal Aviation Administration (USA), Civil Aviation Safety Authority (Australia), Civil Aviation Authority New Zealand (New Zealand) and Department of Civil Aviation (Indonesia). Subjects were seated in the co-pilot seat and completed six simulated landing runs in clear daytime and clear night-time conditions, each of which took approximately 5 min. The Airport Approach spotlight was set at around 330 lux for the daytime and around 50 lux for the night-time run. The order of the light conditions was counterbalanced between subjects within each IOL group. In order to exclude the possibility of a training effect, no flight simulator training was previously performed in both groups. Internal view of the PS4.5 simulator with visual tasks to be completed for the study. PAPI, precision approach path indicator. Radio frequency task: Report the three active or stand-by radio frequency values in the centre console to the left of their seat. The size equivalent of this task was around 6/40 Snellen visual acuity. Airport approach task: Report one ALT (altitude) value corresponding to a DME (distance measuring equipment) DIST (distance) value from the paper-based Airport Approach Chart positioned directly to their right near the window. The size equivalent of this task was around 6/15 Snellen visual acuity. Screen-based console tasks: Report the heading, speed, altitude and fuel-flow values off the console at regular intervals. The size equivalent of these tasks ranged from 6/18 to around 6/30 Snellen visual acuity. Airport approach task: The size equivalent of this task was around 6/15 Snellen visual acuity. Runway precision approach path indicators (PAPI) task: Report the colours of the four PAPI lights on the right side of the runway as the plane prepared for landing at regular intervals. There are four lights either side of the landing strip, and these can be presented as any combination of red and white lights. One GoPro camera was mounted on the yoke within the simulator, which recorded the various values on the console and was used to assist with post-simulator scoring as required. Statistical analyses were performed using SPSS V.23.0, and the level of significance was set at p=0.05. Descriptive statistics were used to analyse the demographic and questionnaire. Normality of data samples was evaluated by means of the Kolmogorov-Smirnov test. Intergroup comparisons of categorical characteristics were performed using Fisher’s exact test. Independent t-tests were used to compare between-group differences in the visual function tests and flight simulator performance measures. Otherwise, when parametric analysis was not possible, the Mann-Whitney U test was applied for comparisons between the two groups. Sample size was calculated with a binary outcome non-inferiority test for the parameter whether the patients pass the CASA vision requirements for a Class 1 and 2 pilot license. If there is a true difference in favour of the experimental treatment of 25%, then 26 patients are required to be 80% sure that the upper limit of a one-sided 95% CI will exclude a difference in favour of the standard group of more than 15%." Twenty-five adults participated in the study, 13 had bilateral MIOLs (mean age 68.1±6.4 years, nine men) and 12 had bilateral monofocal IOLs (mean age 69.8±5.7 years, three men). There were no significant differences in age between the two groups (p=0.47). All subjects in the MIOL group had the same lens model implanted in both eyes, the AT LISA tri 839MP (CZM, Jena, Germany) with powers between 16 and 30 dpt, and two subjects had the toric version. Implantations had taken place at least 1 year before enrolment in the study. Subjects in the monoIOL group had bilateral or mixed implantations of the following IOL models: CT ASPHINA 409MP (CZM), Acrysof SN60WF, Acrysof SN60AT, Acrysof SN6802 and Alcon SN60T3 (Alcon, Ft. Worth, Texas, USA). Visual performance results are shown in table 1. There were no significant differences in the self-reported quality of vision between the multifocal and monofocal IOL groups, for either distance or reading vision during the day and at night (p>0.33). The MIOL group had a significantly higher incidence of halos compared with the monoIOL group (p=0.019). While there was a trend towards greater severity of these haloes in the MIOL group, this did not reach statistical significance (p=0.06). There were no other significant differences in the severity of symptoms between the two groups. There was a trend for greater spectacle freedom for both distance and intermediate activities in the MIOL group compared with the monoIOL group, but these differences were not significant. However, there was a significant difference in spectacle freedom for near activities, with all MIOL subjects reporting spectacle freedom, compared with around 30% in the monoIOL group (p<0.001). There were no significant differences in photopic or mesopic visual acuity (p>0.46) or photopic or mesopic contrast sensitivity (p>0.14) between the groups. MIOL subjects performed significantly worse than the monofocal group on both the Mesotest without and with glare, making on average five to six more errors on both (p<0.025). In addition, the halo area size was significantly larger in the MIOL group (p=0.001). No differences were noted in photopic or mesopic pupil size between the two groups. None of the MIOL group required any additional spectacles to complete the simulator tasks, whereas 2/3 of the monoIOL subjects needed spectacles for near vision. The visual function of the subjects was considered in terms of whether they would have passed the CASA vision requirements for a Class 1 and 2 pilot license (table 2).10 There was a trend for more monoIOL subjects to fail on the basis of monocular visual acuity, but these differences failed to reach significance for either Class 1 (p=0.294) or Class 2 (p=0.109) licenses. The monoIOL group was also more likely to fail the Class 1 license, but again this difference was not significant (p=0.490). In summary, there was no significant difference in the number of subjects in either IOL group who would have either passed or failed the CASA visual acuity requirements at any tested distance. The defocus curves for both groups are presented in figure 2. The monoIOL group demonstrated maximum visual acuity without any defocus (−0.03±0.1 logMAR) and a gradual decline in acuity with increased defocus in both directions. The MIOL group also demonstrated maximum distance acuity without any defocus (−0.06±0.09 logMAR), but there was only a slight reduction in acuity with myopic blur (up to −3.00 dpt). Defocus curve, showing visual acuity across the various levels of defocus for both groups. IOL, intraocular lens. Table 3 presents the mean flight simulator visual performance data for both groups. There was no significant difference in performance between the groups for any parameter. In this study, the vision and flight simulator performance of a group of older adults with MIOLs was compared with that of a group of age-matched adults with monofocal IOLs. This comparative study was undertaken to explore concerns that MIOLs have negative effects on functional vision, and specifically, claims by CASA that multifocal contact lenses and IOLs ‘cause unacceptable impairment of vision’, which precludes individuals with these visual corrections from holding a pilot’s license.6 Performance was assessed both under daytime and night-time flying conditions, given that night-time flying may be more problematic in those with multifocal lenses given the larger pupils associated with low light levels. The literature review done in preparation for this study failed to find any agreed on or scientifically agreed on definition of the terms halo or glare. The tests used, halometry and Mesotest, are considered irregular tests used to try and model the visual experiences of patients after cataract surgery. However, there is no scientifically validated measure or instrument available to measure these phenomena. What has been observed when testing the MIOL participants is that they describe rings around the test LED. It is speculated that these rings may in fact be Fraunhoffer diffractive rings associated with a circular aperture of the pupil and the diffractive rings of the IOL. This observation may open up a more productive area of future research to explore as a more scientifically valid explanation of the visual experiences of patient with these IOLs, compared with the more qualitative terms halo and glare. Significant differences were found—as expected—in the need for near correction with 100% spectacle freedom for near vision in the MIOL group and two-thirds of the monoIOL group needing spectacles for near-vision tasks. 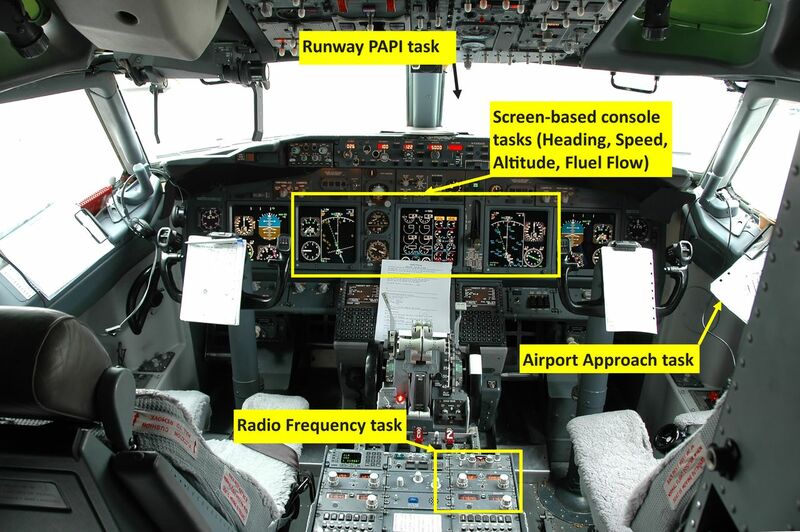 In terms of vision-related flight simulator tasks, there was no significant difference in performance between MIOL and monoIOL subjects for correct recognition of any of the console-based values, including heading, altitude, speed and fuel flow values, accurately reporting from the airport approach chart or reading off the radio frequency values. Importantly, both IOL groups were able to perform these tasks at relatively high levels of accuracy (many subjects achieving 100% accuracy), regardless of whether the flight was made in clear daytime or night-time conditions. These findings are in accordance with those reported for the defocus curves, demonstrating relatively high levels of visual acuity at near and intermediate distances for the MIOL group, with worse results for the monoIOL group. Importantly, the monofocal subjects were able to use near corrections (half-eye reading, bifocals or multifocal spectacles) as required for the flight simulator tasks as indicated in the CASA guidelines.10 Even for the lower light levels of the simulated night-time flights, performance was not significantly impaired for either group and no performance differences between groups were evident. It should, however, be noted that habitual rather than best-corrected spectacles were used for the vision and flight simulator assessment, which may not reflect the situation for a pilot undergoing medical license assessment. There was no significant difference in accuracy of colour recognition of runway lights between both groups regardless of light conditions. This study demonstrated that the ability to complete vision-related flight simulator tasks was not significantly different for the MIOL subjects compared with monofocal IOL subjects. Clearly, comparison of flight simulator performance in a group of pilots with MIOLs to that of pilots with monofocal IOLs would permit inclusion of a wider range of flying tasks, rather than those limited to non-pilots who acted as co-pilots in the simulated flight. However, given that licensed pilots with MIOLs are not permitted to fly, this research was not possible. Nevertheless, we believe that the tasks selected were visually demanding and representative of normal flying conditions as represented in a simulator. In conclusion, this is the first study to explore the flight simulator performance of individuals with MIOLs. The data support previous studies in terms of visual performance with MIOLs. Our findings suggest that the performance of vision-related flight simulator tasks was not significantly impaired in subjects with MIOLs relative to that of age-matched monofocal IOL subjects, who under current licensing arrangements are legally eligible to hold a pilot’s license. CASA. DAME Clinical Practice Guidelines: Cataract. Australian Government 2017. CASA. Civil Aviation Safety Regulations 1998. Australian Government, 1998;15. FAA Guide for Aviation Medical Examiners: Decision Considerations. Disease Protocols - Binocular Multifocal and Accommodating Devices. 2016 https://www.faa.gov/about/office_org/headquarters_offices/avs/offices/aam/ame/guide/dec_cons/disease_prot/binocular/ (accessed 23 Aug 2017). CAA Guidance following eye surgery. Refractive Surgery. 2016 https://www.caa.co.uk/Aeromedical-Examiners/Medical-standards/Pilots- (EASA)/Conditions/Visual/Guidance-following-eye-surgery/ (accessed 23 Aug 2017). Contributors LL planned, conducted and reported the work described in the article and is responsible for the overall content as guarantor. Funding The study was supported by a research grant from Carl Zeiss Meditec AG. Ethics approval Queensland University of Technology Human Research Ethics Committee.